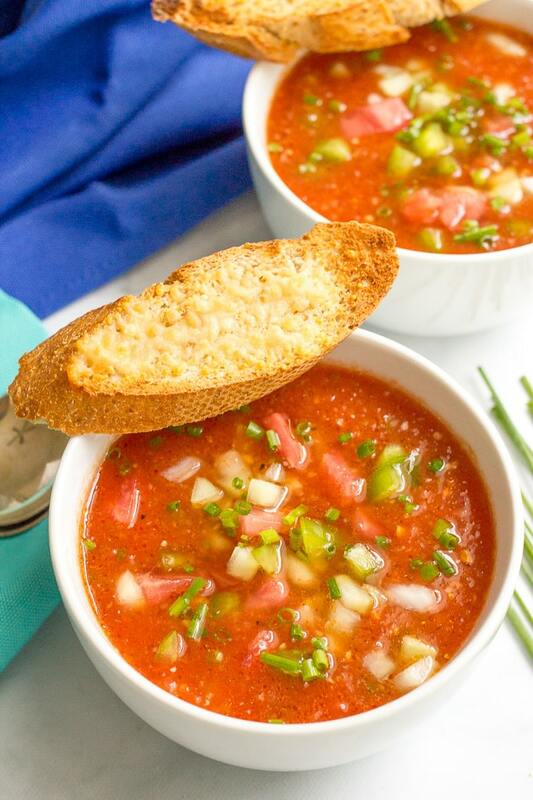 An easy tomato gazpacho soup recipe with plenty of fresh summer veggies! It’s our last week of summer before school starts back here. J will be in the 3-year-old preschool class and M is starting kindergarten. I can’t get my head around either of those things. We’re going to try to live it up these last few days and check off some of our summer bucket list tasks. We may not fit them all in, but we’ve done well! My healthy blueberry cake is a must-make, as are my cheddar chicken burgers and cheesy fiesta grilled chicken for grilling out. And this is also one of my summer must-haves. 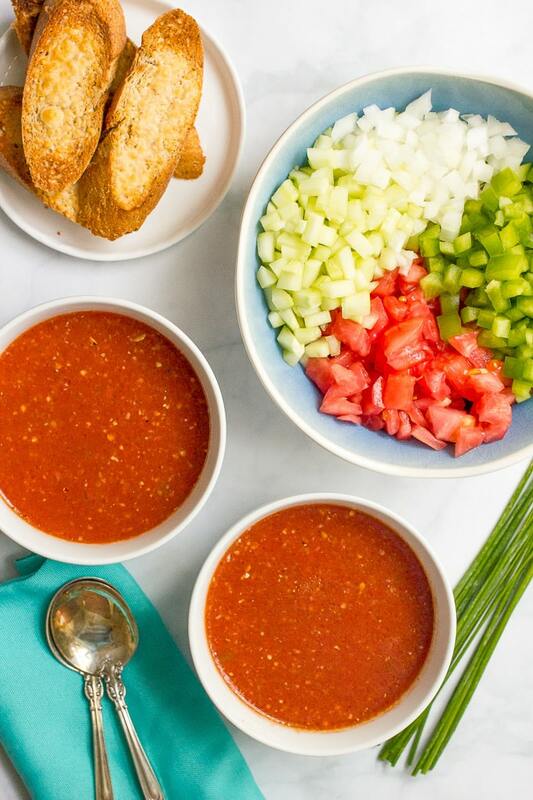 A big bowl of tomato gazpacho soup just screams summertime to me. So fresh and healthy and slurp-able, spoonful after spoonful, this cold summer soup is one of my favorites! One of the absolute best versions I’ve ever had is from a restaurant called The Mustard Seed near Charleston, S.C., where we go to the beach. 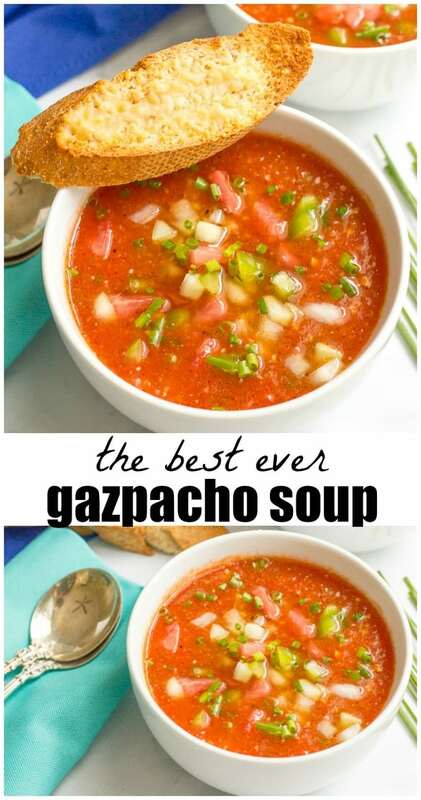 My mom introduced me to their delicious gazpacho years and years ago and I literally cannot go down there now without getting it at least once. I think the record was 4 times in a week. It’s that good. The texture, the flavor, it’s crave-worthy. And it was one of the first things that came to mind for this month’s Recipe Redux theme: vacation food. Not exotic maybe, but I have little ones at home, so we don’t get away that often beyond a little beach trip. So a vacation-inspired recipe had me looking semi local. Luckily, even when we can’t get away, I’ve got a killer recipe for easy gazpacho to make at home. My mom’s neighbor passed along this recipe years ago and it’s the closest I’ve ever had to my beach restaurant spot. And the best part? 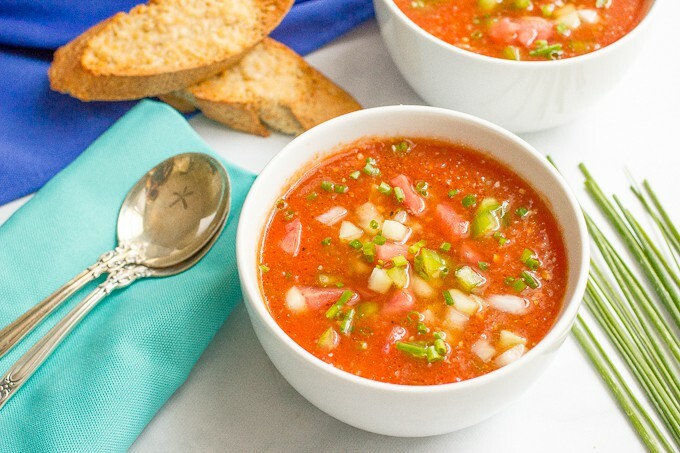 I make a big batch of this gazpacho and I have enough to eat on for days! No additional orders necessary – it’s all mine and right there in my fridge. Plus, it takes just 15 minutes to make (plus a couple of hours to chill in the fridge so all the flavors marry together). I like the texture and taste of having some of the fresh chopped veggies reserved and mixed into the soup before serving. If you want it completely pureed, feel free to blend everything. 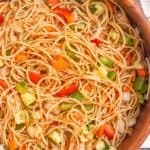 Similarly, chop the vegetables to your desired consistency. You can do a rough chop for a more chunky, rustic soup or a fine chop for a more elegant feel. Peeled tomatoes really help with the texture and consistency of the gazpacho. I just cut the tomatoes in quarters and use a pairing knife to peel back the outer skin from one end to the other. Local summer heirloom tomatoes of course are wonderful in this soup, but it’s delicious with regular vine-ripe red tomatoes as well. I prefer to take out some of the inner seeds of the cucumber for the half that’s chopped and mixed into the soup whole. Want it spicy? Add a jalapeño to the blender for some heat. Want it a little creamy? Serve with a dollop of marscapone cheese or creme fraiche for an elegant topping. Other toppings and pairing ideas include grilled shrimp — that’s one option at the Charleston restaurant. I never get it that way, but it could be fun to serve this for a party in shooter or martini glasses with a grilled or steamed shrimp hanging on the side. You can also serve it with croutons or toasted bread slices. Great for dipping! 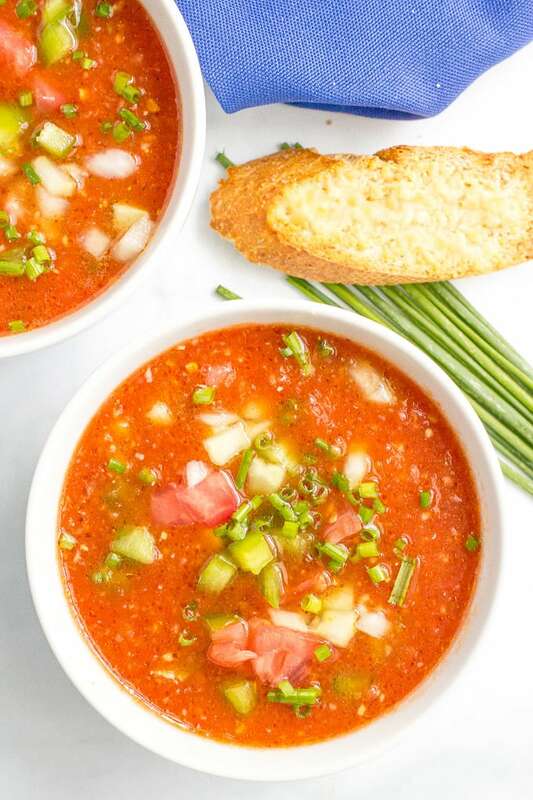 And since regular hot tomato soup goes well with grilled cheese, I like to pair cold gazpacho with a grilled cheese or panini sandwich for an easy and complete summer meal. Or with the recipe I’m bringing you on Wednesday. Stay tuned! Here’s to vacation at home, especially in the waning days of summer. Blend 1 tomato, 1/2 of the cucumber, 1/2 of the onion, 1/4 of the bell pepper and 1/2 cup of the tomato juice in a blender until smooth. Transfer to a bowl and add remaining tomato juice and the olive oil, vinegar, salt, pepper and hot sauce. Cover and chill for 2 or more hours in the refrigerator. Dice the remaining veggies and refrigerate separate from the soup. Stir in garlic and chopped veggies before serving. Sprinkle with chives and serve cold. Leftovers keep in the refrigerator for up to 5 days. Heirloom tomatoes, if available, are great in this soup. But regular vine ripe tomatoes work really well too. To peel the tomatoes, I just cut each one in quarters and use a pairing knife to peel back the outer skin from one end to the other. Want it spicy? Add a jalapeño with the veggies in the blender for some heat. Want it a little creamy? Serve with a dollop of marscapone cheese or creme fraiche. Other toppings include grilled or steamed shrimp, croutons or toasted bread slices. This soup also pairs great with grilled cheese or a panini sandwich for a complete meal. I can’t believe it’s that time of year when kiddos go back to school. Where did the Summer go? Unreal. Seems like only yesterday Summer was starting. Your kiddos must be excited, though! You should definitely try it again!! 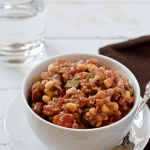 I know there’s lots of recipes and ways to make it, but I love, love, love this version! (And I knew you’d be with me on the jalapeno and shrimp variations!!) Have a wonderful week! 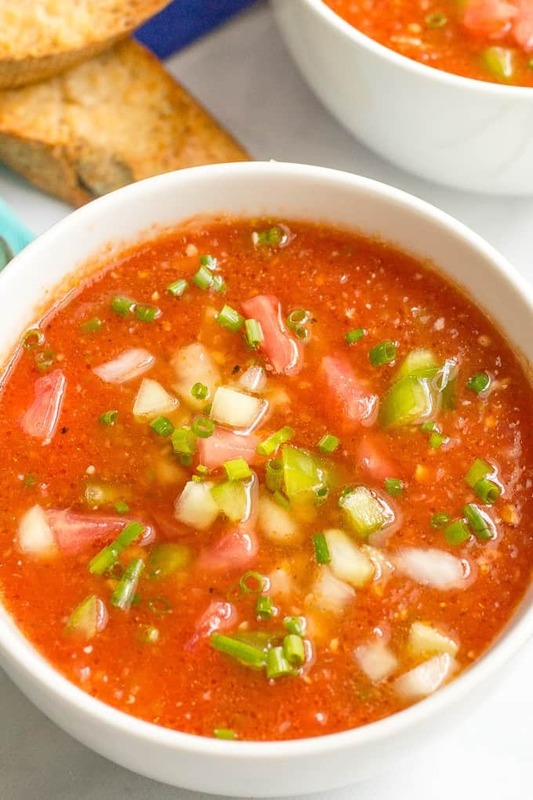 I’ve seen so many lovely gazpacho recipes this summer…I must make one before summer’s end! School starts back up next week here too… although our furry daughter doesn’t attend. 😉 Pre school and kindergarten huh? They are getting BIG!! So glad you have enjoyed this summer, girlfriend! And I hope this last week of it treats you guys well!!! 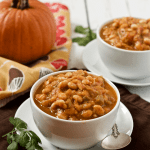 So this soup – all sorts of YES! 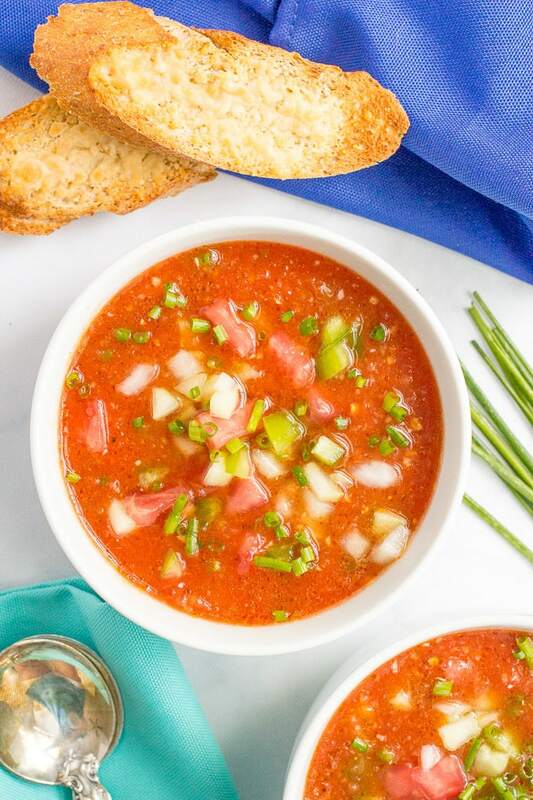 Gazpacho is quintessential summer and I can’t believe the whole season has almost gone by and I haven’t had ANY! Shame on me!! I need to fix that pronto, so thanks for sharing this one! It looks absolutely perfect! And if it tastes identical to your restaurant fav, it must be killer! Pinned! Cheers! This sounds so delicious! Love the freshness of it too! Thanks Sara! It’s got really fresh, bright flavors! 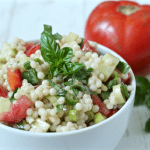 A food summer bucket list…what a fantastic idea!! My daughter starts the 3 year old preschool class tomorrow and I still can’t believe it! This soup looks amazing, definitely going to make it, since we have like 100 tomatoes to use from our garden. 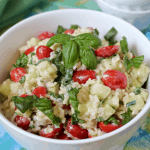 Looks like a delicious way to use all the amazing produce at the farmer’s market! I don’t have any tomato juice. 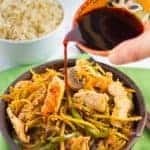 Can I use tomato sauce? Hi Angie! I don’t think tomato sauce will work here, as it doesn’t have the same flavor/seasoning as tomato juice. 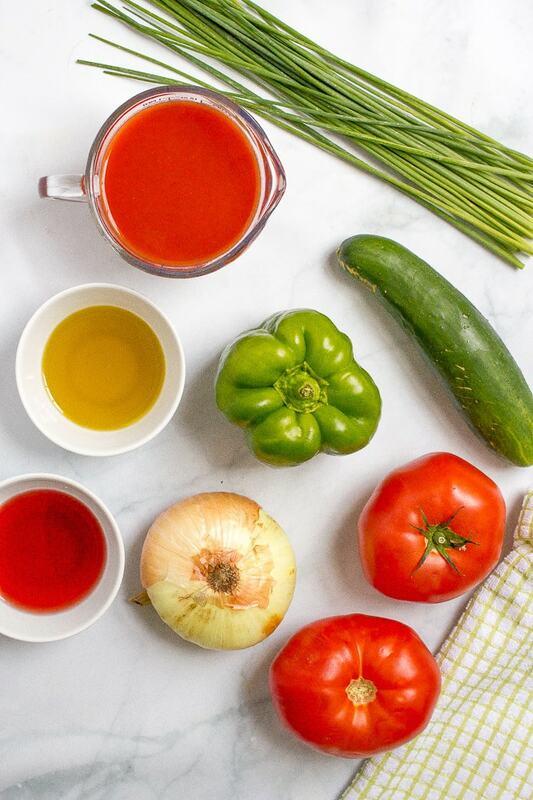 However, I did find this recipe for a homemade tomato juice that you could try if you don’t want to buy it: https://www.simplyrecipes.com/recipes/homemade_tomato_juice/ Hope that helps!